I believe this was earlier called the White Lion. 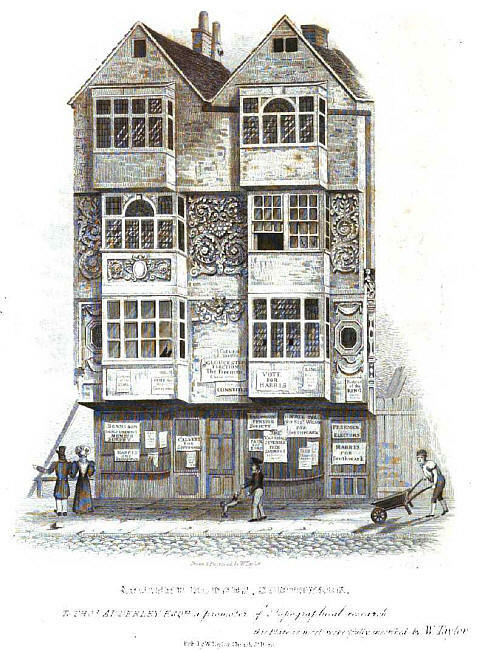 The Annals of St Mary Overy (1833) relates this description to an engraving of "A few years ago many houses in the High Street retained the form of building of the time of Queen Elizabeth, of which the accompanying engraving is a good specimen; this has been divided into two houses, one of which was well known as Baxter's Wine Vaults; but I am much inclined to think that they only formed a part of some more spacious building; adjacent to them are premises (yet standing) last in the occupation of Solomon Davis, Esq. which I have no doubt once communicated with them, the apartments here have an air of grandeur, one room in particular being in high preservation, having oak pilasters and paneling, with a lofty and rich fireplace, but partly modernized; the ceiling is particularly fine, being divided into numerous beautiful compartments which cannot be described without the aid of the pencil, in the centre is the Arms of Queen Elizabeth in a lozenge shaped shield, with the initials E. R."; the building clearly is being used for elections at this time; e.g. Calvert is a known candidate in the 1820s and 1830s. A listing of historical London public houses, Taverns, Inns, Beer Houses and Hotels in Southwark St Saviour, Surrey, London. The Southwark St Saviour, Surrey , London listing uses information from census, Trade Directories and History to add licensees, bar staff, Lodgers and Visitors.